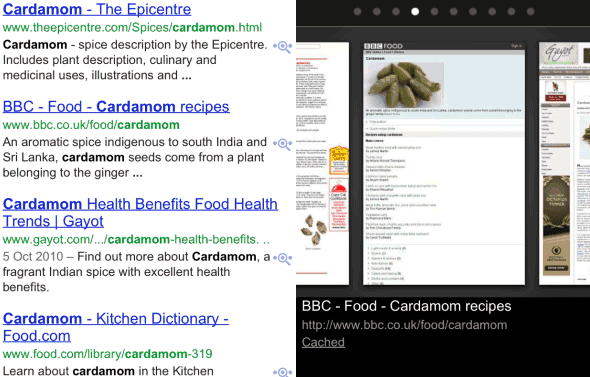 Maybe it's not so obvious, but the link to the cached version of a search result is still available when you're using Google Search on a mobile phone. Just like in the desktop interface, you need to click the Instant Preview icon (a magnifier) and you'll find the "cached" link. For some reason, the links to the mobile formatted version and to the list of similar pages are no longer displayed. To go back to the old interface that displayed all these links next to the search results, bookmark http://www.google.com/m or replace "google.com/search" with "google.com/m/search" in the URL (just add the two characters in bold). Oh! there's a cache pages in mobile search? I don't know about that. That is cool. 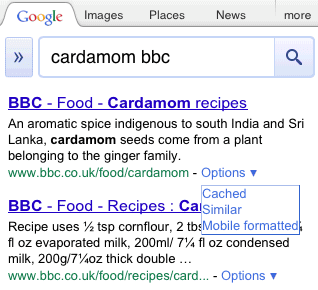 You can also start your search with "cache:" to get to the cache of any particular page. Works well with Chrome's address bar. This doesn't work anymore. Typing in that url just takes you to the same Google mobile search that still lacks the cache view options.